Millsy and I have both been busy with our respective Gloranthan projects of late, and as I have the day off today, I thought I'd post some pics of the Orlanthi Thane I'd converted. I finished him to this point late last night. He'll need some extra bling, since he's meant to be high status, and this will probably take the form of some runic symbolism on his shield (stay steady, hands...) and some decorative trim on the clothing. The wolfskin cloak is a probable trophy from the hunt, or maybe from battles with the Telmori, the wolf folk of Dragon Pass. 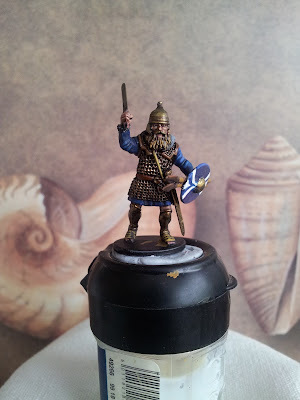 I tried to avoid using any sort of shield iconography which might make a viewer automatically assume that Orlanthi are just transplanted Celts or 'Land Vikings' (though if anyone made 28mm plastic Halstatt Celts, I'd certainly try and lay hands on a boxed set or two!). Obviously, the massed units will probably be bog-standard plastic Celts with a few decorative tweaks to keep them from looking too Gallic or British (note to self; avoid plaid wherever possible, it's not like I haven't seen enough to last me a lifetime, after all). The economics of collecting an army mean that we have to be ready to compromise from time to time! Let's just hope that Orlanthi are more durable than Celts in the face of massed heavy infantry, which my illustrious adversary Mr Mills is assembling even as we speak... Though, to be fair, the ability to summon thunderbolts and wind elementals should more than make up for any shortfalls in discipline! 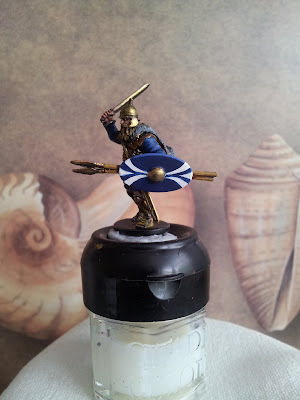 This chappie will probably end up based as part of a massed unit of Warriors (according to our preferred Ancients rule set, Simon Miller's To the Strongest!) so I'd better get cracking on his retinue. Cool stuff, Evan! Is your Glorantha project for a wargame, or role playing? 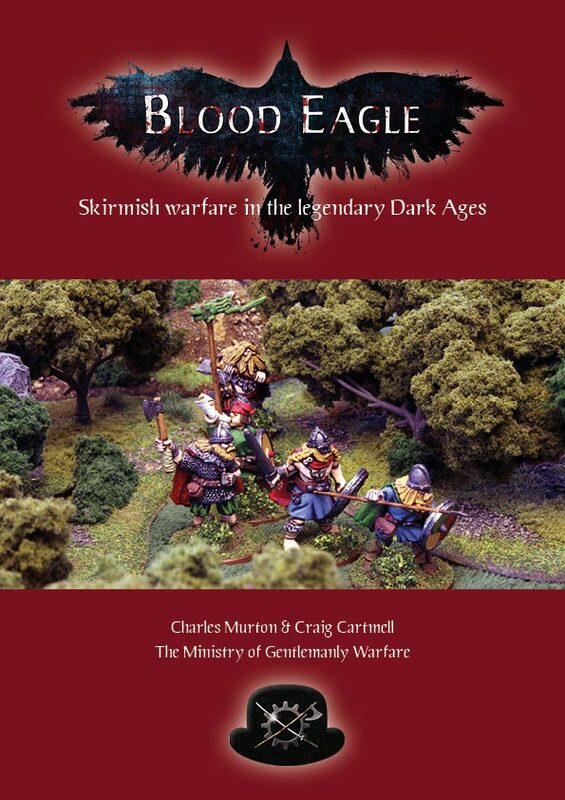 Millsy and I hope to assemble a Gloranthan army each and play some wargames using Simon Miller's new rule set, To the Strongest! Slow progress for me so far, but it's early days yet. Thanks for the kind words! Great looking figure.I can't wait to see his fellow warriors. 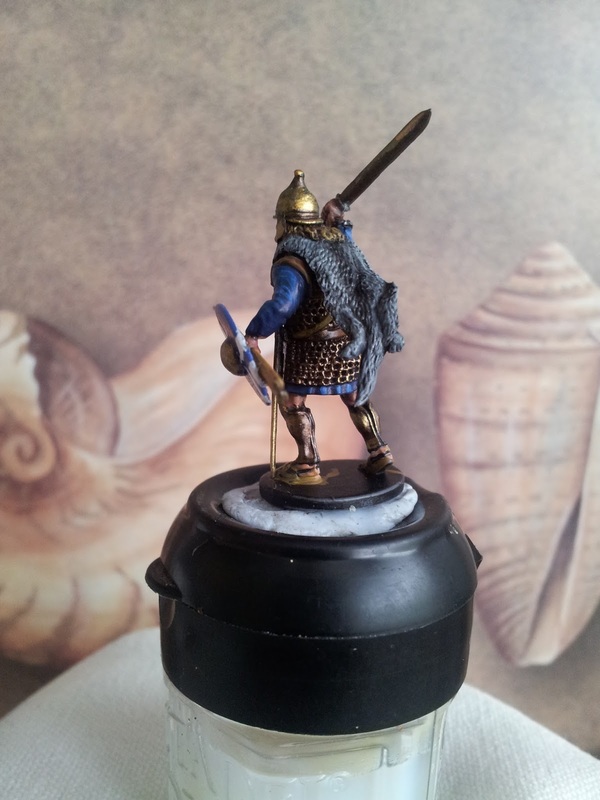 have you thought about using him in some skirmish gaming whilst the armies are being built up? To be honest, I hadn't considered Gloranthan skirmish-level games, but now you mention it, that might be an idea! 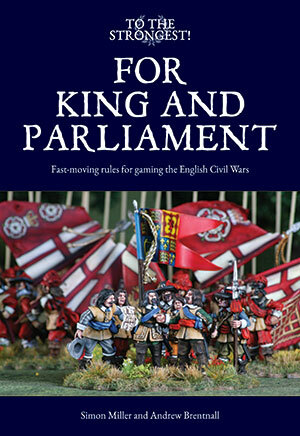 Though I mustn't allow myself to be distracted from the task at hand, perhaps I could rustle up a few conversions for skirmish or RPG between units... food for thought there, thanks again! Great job Evan, beautiful details, face, armor, helm, cloak...each of them is superb! Thank you Phil, I've just started using the Vallejo metallics, and they are certainly up to the task of tinting bronze arms and armour. He's the first of many, I hope! Absolutely loving him, Evan! Great stuff. I started a little writing on the fantasy version of TtS! yesterday and today I'm going to order the terrain cloths. Thanks Simon - as he's the leader of a unit of warriors, I'm considering taking a leaf from your book and using semicircular bases for attached command groups so I can keep some flexibility in deployment for TtS! I look forward to seeing what you come up with for the fantasy expansion - though if air elementals trump Lunar military magicians 5 times out of 6, I'll be very happy indeed! Don't base quite yet, Evan, I have something special in mind for basing for my RQ armies. More anon. Stunning work and gallant figure. Thanks max, he's a lot like Vercingetorix, but with a twist - no iron! You were not wrong, thanks for the advice! Now get to work on those Silver Shields! Thank you, Mr Awdry; he's still a work in progress though! A beautiful figure, he has a Celtic look about him. Yes, there's definitely some Celt in his DNA, notably the head, the sword, the shield and the scabbard, which were cannibalised from a plastic boxed set of Warlord Celts. The torso and limbs were from a Victrix Carthaginian veteran, while the wolf pelt came from the Agema Miniatures Roman Republican Velites box. All in all, a varied heritage!